Corporate video production services are our speciality and we’ve created professionally designed business videos and company films for some of the biggest companies in the world. · As corporate video producers we offer additional services to enhance your videos quality such as speech writing and PowerPoint presentation design. In today’s ultra-competitive marketplace, we understand the importance of growing and protecting a company’s brand. We’re happy to sign confidentiality agreements, as most of the corporate films we produce are for internal communications. Having created corporate films for several global companies, we’re able to produce Internet Videos and Virtual Events in multiple languages for audiences all over the world. Unlike other corporate video companies, our video production is unique. By combining several technologies together, we’re able to create any type of corporate video at a fraction of the cost of conventional video – allowing clients video and communication budgets to stretch further. As a leading corporate video production company, we’re proud of the work we’ve produced for our clients. 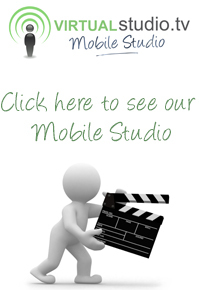 To find out more about our services, please contact us today, find out more about us, review our testimonials or check out the latest VirtualStudio.TV Monthly Video Newsletter.